Guided Fishing Charters on the Fraser River and its Tributaries near Vancouver, BC. Book with Confidence! We have been producing consistent results on the Fraser River and its tributaries targeting salmon and sturgeon for over a decade! At Double Header Guided Sport Fishing we fish the Fraser River, Harrison River and their tributaries for White Sturgeon and Pacific Salmon. Radek Hanus, owner and operator of Double Header Sport Fishing is considered one of the premier and most productive Sturgeon and Salmon fishing guides on these rivers. We're based out of Mission, British Columbia, Canada, near Vancouver. Whether you're after a trophy Fraser River White Sturgeon, or wanting to catch one of the Pacific Salmon on gear or fly, Radek is your go to guy. We cater to fisher people of all ages and skill levels. Boat, fully licensed and insured fishing guide, all tackle and equipment, bait, breathable waders and boots, (if required) water and light snack. Please, arrange to bring your own raincoat! Lunches and refreshments can be supplied by request at an additional cost of $15 per person. We pride ourselves in keeping attention to all the little details that are specific to your group. Come on board with us, to experience the Double Header difference! To ensure you're getting excellent value for your dollar we have checked our competitors posted prices for you! 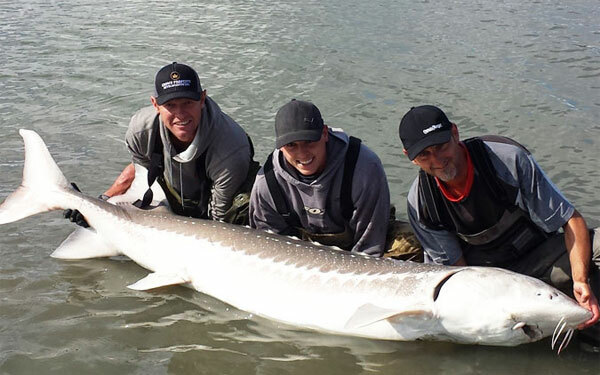 Double Header Sport Fishing guarantees you'll catch a Fraser River White Sturgeon, or your money back! 2019 should be a fantastic year for salmon and sturgeon fishing on the Fraser River and its tributaries near Vancouver, BC. Although it’s not likely the Sockeye salmon will be open for retention as it’s the low year of the cycle, chinook fishing should be solid with lower than expected snow pack. Starting last week of August, Pink salmon will be making their way back providing us with excellent fishing opportunities. Not too far behind will be the Coho and Chum Salmon. Sturgeon fishing should once again be solid. Prime dates, especially weekends book up fast, so book your fishing trip soon!